it’s very important to document what you’ve done, even if they are just little things for yourself and show the before and after. 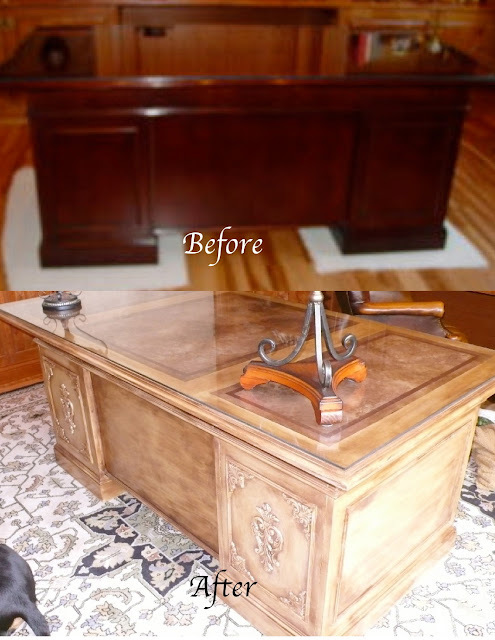 This project I did was for client who had a very dark cherry wood desk and they wanted it updates with a vintage feel. I think the dark wood kind of looked like a void among all of the other dark wood in the room. So we updated the desk and file cabinet to match with wood appliqués,paint and glaze. You can make an easy update for not a lot of investment. When it comes to getting hired, moving on or moving forward, past experience is everything. Keeping a photographic diary of your successes and even not quite-so-wonderful projects can mean the difference between getting to where you want to be. Or not. Don’t be afraid to take many angles, or ” too many pictures”, even of the most mundane details. And keep pictures even if the quality isn’t the best. And always take your own picture then and there, even if the project isn’t 100%. If you rely on someone else to send you a picture, you may never get it. Things might not seem important at the time…. You never know what’s going to be important later. It’s frustrating to end up with the “why didn’t I take that before picture..” or “why didn’t I just snap it when I had the chance?” syndrome. It’s better to be in control of your own destiny. Even if it’s only digital.